Just three miles from downtown Houston, Sunset Heights is nestled in the heart of a world-class urban city that grows and changes each day. It is located in Houston's Historic Heights neighborhood. It is mere minutes away (walking or driving) from some of Houston's greatest retail and dining experiences as well as other amenities that make for a great quality of life – state-of- the-art museums, parks, grocery stores. Your ideas and participation matter for the vitality and community of Sunset Heights. Please let us know your point of view! Explore our site and find out how you can contribute. We're committed to our neighborhood in three ways: information, networking and local projects "to make Sunset Heights a better place to live." 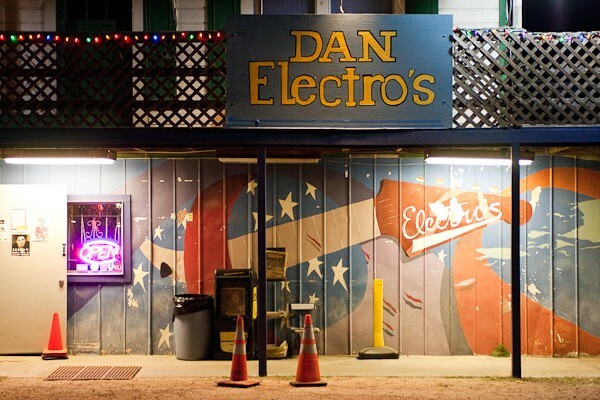 Our local friends at Dan Electro's Guitar Bar! They have been rockin' it up since 1988 and are a staple of Houston's live music scene. Sunset Heights is located 10 mins. northwest of downtown Houston, and just north of 19th Street, the center of Heights retail. The Sunset Heights community has an understated personality, but one with unique spirit. See us work and play in this fun image wall. Take a look.